Oh, Jersey Turnpike, how I don't miss you! Actually, I was more a frequenter of the Garden State Parkway during my years in New York, frequently visiting my grandmother in Ocean City. 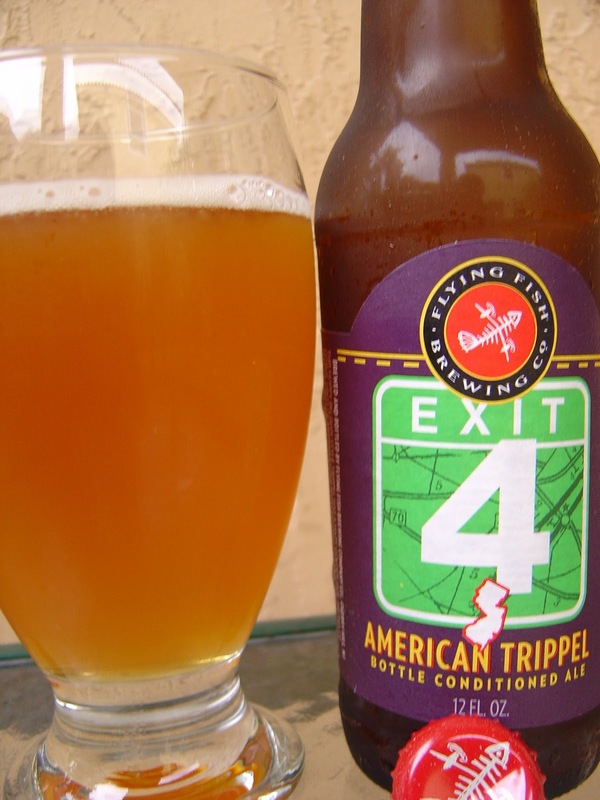 Today I'm drinking Exit 4 American Trippel brewed by Flying Fish Brewing Company in Cherry Hill, New Jersey. According to the Exit Series website set up for this "experiment", "The Exit Series of beers is a multi-year brewing experiment to brew a series of beers as diverse as the great state of New Jersey." I can't wait to see what flavor profile and style they come up with when they get to Snooki's exit! Fruity peach aroma with candy and sugar and alcohol. Honey flavors are very noticeable right in the beginning, accentuated fantastically by the 9.5% alcohol. Plenty of pure sugar and candy follow and mix nicely with fruity mangoes and peaches, very tropical. There is definitely a kick of spicy black pepper and cloves as well. The yeast also stands out and is distinctly Belgian. Syrupy consistency, low carbonation. While there is a bitter component that tries to fight back, the boozy yeasty syrupy is a little much. Definitely not my favorite, though Exit 4 is a pretty decent beer in general. Check it out when you can. I've only had the Hopfish IPA, but after reading your review, I'll look for Exit 4 on my next shopping trip. No I haven't had the opportunity to try Exit 13. It's not available here in Florida.